Perfect your signature espresso-based drinks with Ghirardelli 17 oz. caramel flavoring sauce! Made with premium ingredients, this sauce has a creamy, slow-cooked caramel flavor and velvety-smooth consistency for crafting your coffee shop drinks. Use it for lattes, frappes, milkshakes, and even frozen cocktails. Besides beverages, this indulgent caramel sauce is perfect for topping ice cream, frozen yogurt, cheesecakes, and many other decadent desserts. Not only does it enhance the taste of your tempting treats, but it also improves the look and presentation of your offerings to delight patrons and help boost impulse sales. This is fantastic caramel flavoring sauce. This goes good on everything from drinks and milkshakes to pancakes. Its name brand and has the quality and flavor to back it up. It's a much deeper flavor than the syrupy stuff kids mix into glasses of milk. But a thinner consistency than what comes out of a jar labeled "ice cream topping". Great caramel flavor, and a texture that sits perfectly on whipped cream (even the kind out of a can). I drizzled some on a brownie last night and was in heaven! Plain Carmel sauce that is pure and wonderful tasting as expected from a company like Ghirardelli. We will definitely buy more as we are almost out as we use as a drizzle of numerous drinks and cupcake desserts. Cant beat the quality of ghirardelli. Its quality is amazing and I havent found anything better. Makes the perfect drizzle and the style of bottle and lid is great. First time buying, good product, used on a hot cocoa bar. This is the only one that we bought and didn't transfer into it's own jar because we trust the brand and it looked nice as is. Rich, thick, delicious caramel flavor! Not so thin and runny where it doesn't hold it's own and not so thick that it makes it hard to squeeze out, it's the perfect consistency. Great for topping coffee drinks, ice cream, waffles, or as a dessert plate garnish. The possibilities are limitless. Time to get creative! The caramel has a good flavor. Very authentic tasting, not artificial. Easy to use a lot of it. Doesn't leave a weird after taste which is nice. Caramel is famous as much as coffee itself. So using a good caramel is important as using a good coffee. Sauce is a great alternative for customers who don’t like liquid flavors. There is simply no other caramel that would taste better when making coffee and ice cream drinks. Ghirardelli has a remarkable brand quality and you will not be disappointed. The price is excellent!! Taste great and is very thick. Sometimes to thick. We have to heat ours up in the winter to come out right. But will buy again. This is a great sauce to have handy for coffee and fruit. Apple slices become a special treat with a little drizzle. Bananas become a richer more flavorful snack and Graham crackers become a new adventure! Ghirardelli caramel sauce has been a wonderful addition to our shop. We love the price that is offered through your store & our customer's love the quality and taste of this product. We use it mostly to line our milkshake cups and in & on our milkshakes. We also use it as a drizzle on our sundaes and baked donuts too. Very taste flavor. Great brand and our customers love it. We cannot keep this in stock always ordering it. Very happy with this item and the taste. This small container of caramel sauce is perfect for drizzling on top of our specialty drinks as well as decorating baked goods. We will likely not buy the small bottles again and just refill them from the large 64 ounce bottles of sauce. We wanted a caramel sauce for our sundae bars and this is delicious ... Ghirardelli Caramel Sauce, we are so glad we found you!! Yum yum yummy! When I eat this sauce I'm transported to a world of pure ecstasy. The rich creamy texture is mouth watering at first sight. I was truly blown away by this sauce. Just wow! Arrived on time as well. This sauce is a perfect, drizzly sauce for anything imaginable! It tastes great on top of the whipped cream on a frappe and especially on ice cream! Another great flavoring sauce made by Ghirardelli. This is the most delicious caramel sauce that I have ever tasted. It is now on our ice cream bar and it is very popular. I love caramel and this sauce was sweet and tasty. It worked perfect as a add-in to my caramel cakes and on top of my mini cheescakes. We originally started with the chocolate flavor from Ghirardelli’s and customers loved it so much, we added the caramel and white chocolate. Now, I am not sure which we love better. Our customers love this caramel flavor over our waffles with sliced bananas or just on waffles by itself. It pours easier than the chocolate too. We say buy a case of all 3 flavors and really promote the Ghirardelli’s brand quality and long company history. The product is of good quality. It was fresh and of good consistency. The bottle was easy to pour and to store. The syrup is not too sweet. When it comes to caramel based drinks, look no further. We believe we have found the finest caramel sauce/topping to incorporate in our menu. So delicious. You won't be dissapointed. Love this stuff, but it has a shorter shelf life than others. It is thick and rich, and we'll probably switch back to it (hopefully in the large bottles) once we get more established here. As always this products name speaks for itself, always consistent, tastes great and people love this stuff! We use several different flavors in the Ghiradelli family, never disappointed! Any Ghirardelli product is going to be delicious and this is no exception. This caramel flavoring sauce is rich and creamy and great for dressing up and drink or dessert. I purchased this for home and use it when making lattes and other espresso beverages. It also works great as an ice cream topping. I love how easily it squeezes out and the flavor is excellent. This caramel sauce is delicious, another great product from Ghiradelli. It's rich with a perfect balance of salty and sweet. I mostly use it to top ice cream. Ghirardelli makes a fantastic Caramel flavoring sauce that comes out easily and coats the substrate. Most of our customers use this to make Caramel Frappes as well as drizzle over dessert dishes. 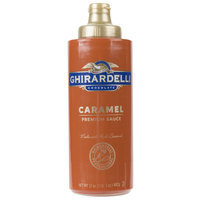 Ghirardelli is the best and this caramel sauce is another example of their quality products. I tried this as a filling and drizzle for my chocolate salted caramel cupcakes and it was just as good as if I had made my own caramel sauce. This caramel sauce is great in coffee to make a flavored drink, drizzled on a plate with fruit or as an addition to your favorite dessert, ice cream or brownie. Ghiradelli is a well known brand in the industry. this caramel flavoring sauce is pretty delicious. it is great to have for flavoring coffee drinks or even drizzling on dessert. This has true caramel flavor. It was simply delicious. Consistency is slightly thinner than the Torani caramel syrup, but flavor was on par. Not just pure sugar, it actually tasted like caramel too. The only complaint is the nozzle. It has one of those rubber tips whereby you have to squeeze a certain amount on the bottle to get the syrup to pour out, so it can glob out unexpectedly initially until you get the flow going. Well there isn't a lot more to say other than its Ghiardelli. You know the product is going to be good always and you know the flavor is immaculate! Great flavor for pre-packaged caramel sauce. We use this for coffee and espresso drinks. Decent price based on purchasing locally. We will purchase this again. Magnificent!! There are no cons with this sauce. Good on ice cream, on whipped cream for drink toppers or just straight up in the drink itself and then give it a good stir, absolutely fabulous! This Carmel is really good. They used to use it in Starbucks, but besides that, it is really great tasting and tastes great on ice cream. The Ghirardelli Sauces are of a very good quality and Webstaurant has some of the best prices. Our customers love the consistency and flavor of all the sauces. This is a tasty product. The texture and consistency are also very good. It is a sauce so it's much more versatile than those very thing syrups. We are still awaiting our shipment of the smaller, 16 oz. Caramel sauce. However, we ordered the 64oz. also and have to say it is some of the best, quality caramel sauce that we have tasted! We will most likely use the smaller bottle for drizzles, etc and the bigger bottle for drink mixing! I Love this delicious caramel sauce for making drizzles for my gourmet cupcakes -you really can't go wrong with a well known name like Ghiradelli. True to form, I love Ghirardelli sauces. This caramel flavor does not disappoint. I use it mainly for flavoring my coffee and hot chocolate drinks, but it goes really well with dessert pastries and ice cream. Definitely recommend!